Project Oliver | A site to raise awareness and funds for Oliver's new home. Primarily Primates Animal Sanctuary completes construction on another exciting grass bottomed habitat for chimpanzees at the sanctuary. 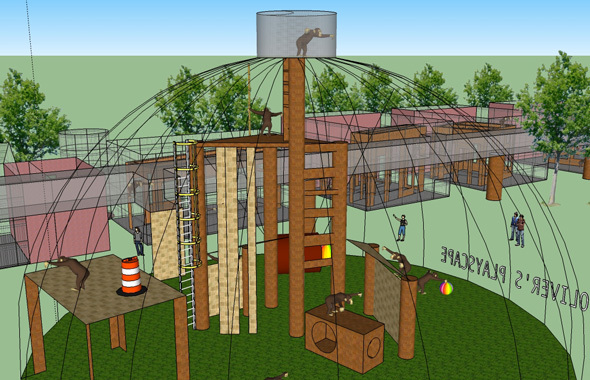 Primarily Primates is close to erecting a large grass bottomed habitat for chimpanzees at the sanctuary, and young sanctuary supporter, Gracie Chavez, tells the story of Bo and the Primadome. Enrichment Coordinator, Brooke Chavez, creates enriching experiences for the animals at the Primarily Primates animal sanctuary. Primarily Primates animal caregiver, Joseph, brightens the day of many of the chimpanzees at the sanctuary by bringing them one of their favorite treats; coconuts. Oliver’s ashes are scattered by the PPI staff who knew him best. In memory of Oliver, Oliver’s chimpanzee friends enjoy Oliver’s favorite coconut/raspberry sorbet. A week before he passed away, Oliver sat in his patch of grass dining on various fruits and vegetables while his human friends and family kept him company. The feast concluded with his favorite treat that he would get from time to time and always enjoyed; coconut sorbet. The care staff at Primarily Primates Animal Sanctuary explores new ways to re-introduce natural elements to Oliver’s current habitat. 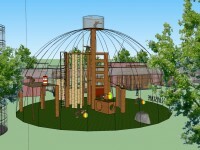 There are many great projects going on at Primarily Primates Animal sanctuary. Today they welcome two new residents, Calder and Greer. It’s been a few days, and Oliver has refused to eat anything but grapes. Can the Primarily Primates tempt his appetite with a Mother’s Day brunch? As part of “Project Oliver” we are in the process of finding people from Oliver’s past so that we can more accurately document his life. This is a short excerpt from former animal trainer, Janet (Berger) Danner. While walking through the Primarily Primates Animal Sanctuary, Filmmaker Andy Cockrum stumbles upon a most interesting chimpanzee activity. Artist Heyd Fontenot, visits the Primarily Primates Animal Sanctuary to illustrate a few possible concepts for a new green space for Oliver the chimpanzee. Phase One: A local Eagle Scout troop, design and build new enrichment features for Oliver’s home at Primarily Primates Animal Sanctuary. Twenty five Java Macaques arrive at Primarily Primates after their release from a New Jersey toxicology lab. It’s up to the sanctuary to give these animals a new life free from restraining collars and isolation. Episode 2: What is Project Oliver? Episode 1: Who is Oliver? In the 1970’s he was world famous. Then, he was all but forgotten. Follow his incredible journey and bring him home to green. Submit your info below to receive news and updates about Oliver. 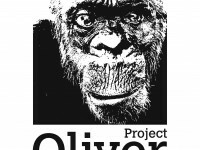 Project Oliver - the web series, hopes to inspire the funding, design and building of a new green space that will be built in Oliver the chimpanzee's memory. That habitat would have a grass bottom with various climbing structures and enrichment elements. 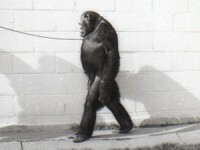 Tunnels from other chimpanzee habitats would enable different chimpanzee groups to take turns enjoying this new environment. Many of them, will be able to walk on the grass for the first time in years.